The two books of Samuel were originally one. The division between the two parts was made by Christian writers after the time of Christ, and was not accepted by Hebrew scholars until the sixteenth century. 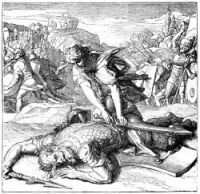 The theme of 1 Samuel, as now divided from the second, is the abandonment of the old theocratic government of Israel and the founding of the kingship. 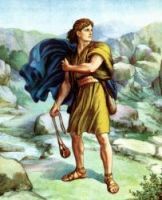 It begins with the story of Samuel, the last of the priestly "judges" over Israel, tells of his achievements, of the clamor of the people for a king, of Samuel's selection of Saul for the high office, and of Saul's brilliant but tragic career, closing with his death. 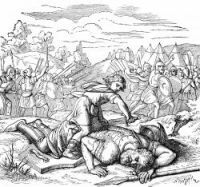 Toward the end of the book, Saul's successor, David, becomes a more prominent figure than the king. The authorship of the books is unknown. The Hebrews say that Samuel himself wrote at least the earlier part of the first book. A similar suggestion is found in the Bible. Probably there were several early works, including a life of Samuel, and a life of Saul. Those were incorporated, about the time of King Josiah, into a single narrative including Judges, Samuel, and Kings. This work was then divided into its three larger books after the downfall of Jerusalem. This series of images from the 1 Samuel is from my collection of antique Bible books. Feel free to use these pictures from 1 Samuel in your artwork. 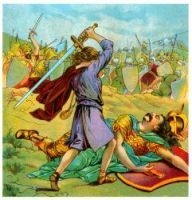 Click on the 1 Samuel illustrations below to see more details about saving a free 1 Samuel image or about purchasing the images from the first Book of Samuel at a higher resolution.